one of the founders of Baringin Sakti. These 3 pendekar promised to build an Silat school and they chose the name: Baringin Sakti that specialize in Silat Minang. They chose the name Baringin Sakti, because in the center of the city Padang, grew a big and strong Baringin tree for hundreds of years. 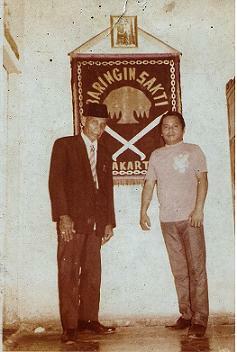 Baringin Sakti incorporated many styles of Silat from Minang. Guru Eric Kruk has been doing Indonesian Pencak Silat for more than 16 years. Some of the styles he has trained in are Mande Muda and Harimau. Guru Kruk has lived and trained in Indonesia over the course of the past 13 years and is currently the Head Representative of Baringin Sakti USA. The system that is taught at this time in the USA is called Harimau Minangkabau. Harimau Minangkabau can be used for street fighting purposes and consists of extensive leg conditioning, power kicking to the lower body, open palm strikes, and quick body movement for effective ground fighting. In 1994, Eric Kruk started his beginning of Pencak Silat. First training with Sifu Paul Marrero in Mande Muda for 6 years. During this time training with the late Pendekar Herman Suwanda during several seminars and a first trip to Indonesia in 1997. Starting in 1999 , while living in Indonesia, Guru Eric Kruk started his training under Grandmaster Edward Lebe of Baringin Sakti Pencak Silat Harimau Minangkabau. Grandmaster Lebe was the senior student of Grandmaster Abu Zahar, and succeeded him as the head of Baringin Sakti Pencak Silat Harimau Minangkabau. After returning from Indonesia, Guru Eric Kruk was appointed Head Representative Of Baringin Sakti Pencak Silat Harimau Minangkabau for the USA under Grandmaster Edward Lebe from 1999-2007. Guru Eric Kruk has since started a new organization, Baringin Sakti Pencak Silat USA Harimau Minangkabau, and is currently teaching to a small group in Anthem, Arizona. He often does seminars across the USA and in Europe, promoting Pencak Silat and Indonesian culture, and often travels with students to Indonesia for training and cultural experiences. He has also trained a unit of Indonesian Special Forces (Kopassus). Baringin Sakti Pencak Silat USA Harimau Minangkabau under Guru Eric Kruk, is taught for combative purposes and for self-defense. Training consist of groundfighting, palm strikes, kicks, knees, sweeps, and intense conditioning. STATEMENT TO THE SILAT COMMUNITY- I want it to be known to everyone that I have NO affiliation with Grandmaster Edward Lebe of Baringin Sakti Pencak Silat Pasaman Harimau Minangkabau of Indonesia or his representatives here in USA that are underneath him. I resigned my position underneath him in 2007. I represent myself and my family here in the USA and in Bandung, Indonesia. If you wish to train with him, contact him. If you have any questions regarding our training I teach or who are my representatives, feel free to contact me at anytime.